Breathe in and out. Feels good, right? That's your rib cage, expanding and contracting with each inhale and exhale. But your rib cage certainly doesn't do all the work, and if you thought it did, I want you to apologize to the muscles in your back, thorax, and neck. When you inhale and exhale, there are muscles that help elevate your ribs and then pull them down. We're going to look at a pair of them that do just that: the serratus posterior inferior and superior. The serratus posterior inferior and serratus posterior superior are two different muscles, but they are mirror images of each other. Winglike in shape, the superior is situated at the upper part of the posterior thorax, while the inferior is at the lower part. The serratus posterior superior helps to elevate the upper ribs during inhalation. 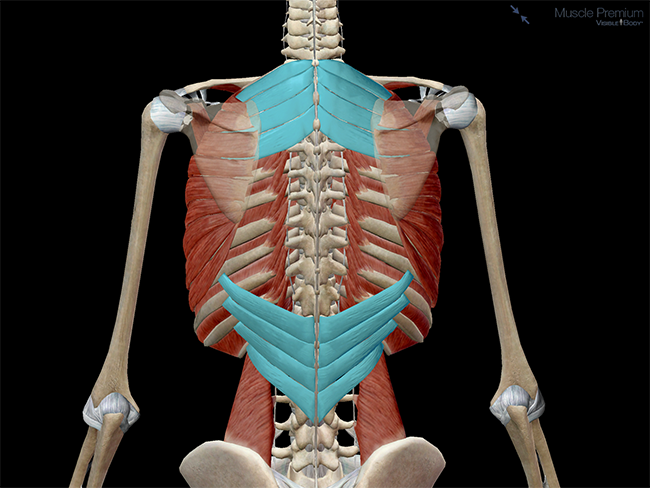 The serratus posterior inferior, inversely, helps to draw the lower ribs downward and backward during exhalation. Both muscles attach to various ribs and parts of the spine. The serratus posterior superior originates on the supraspinal ligament, the ligamentum nuchae, the spinous processes of the upper two to three thoracic vertebrae (T01–T03), as well as the seventh cervical vertebra. It inserts on the upper borders of ribs 2–5, and is innervated by intercostal nerves 2–5. The serratus posterior inferior originates on the supraspinal ligament, and the spinous processes of the upper two to three lumbar vertebrae (L01–L03) and the lower two thoracic vertebrae (T11–T12). It inserts on the lower borders of ribs 9–12, and is innervated by intercostal nerves 9–12. The serratus posterior superior is, because of its location (the shoulder girdle region), sometimes a bit of a troublemaker; its pain pattern overlaps with that of other muscles. Deep aches under the shoulder blade or in the back of the shoulder, the point of the elbow, and the pinky side of the wrist and hand are common symptoms of trigger points (muscle knots) in the serratus posterior superior muscle. 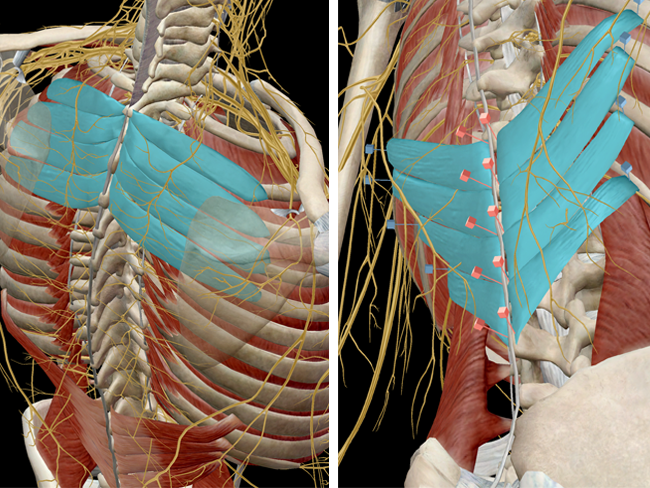 What causes trigger points in the serratus posterior superior? Heavy breathing during strenuous activity, or struggling for breath during respiratory illness, such as pneumonia. Resting the muscle for a few days, or even visiting a chiropractor, can help ease the pain and improve mobility. Are you an instructor? 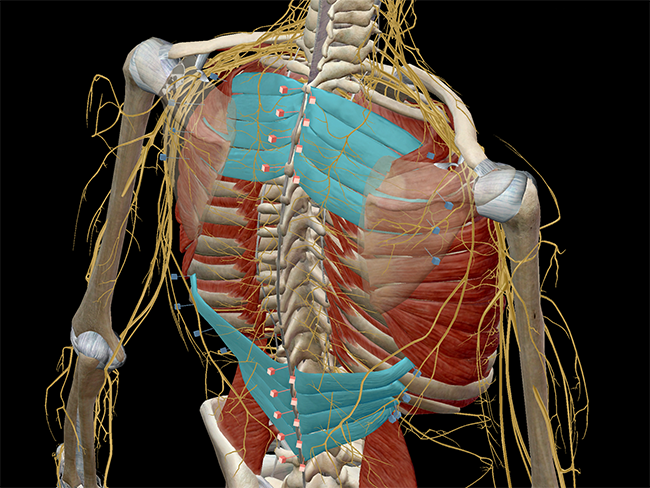 We have award-winning 3D products and resources for your anatomy and physiology course! Learn more here. - Davies, Clair. "Chapter 6: Shoulder Treatment, Part B." Frozen Shoulder Workbook: Trigger Point Therapy for Overcoming Pain & Regaining Range of Motion. Oakland, CA: New Harbinger Publications, 2006. 166-68. Print.